It is a glorious day in the hills of the Algarve today and this morning’s walk was just amazing. Apart from a few areas of mist, a cloud free sky and warm once the sun came up. 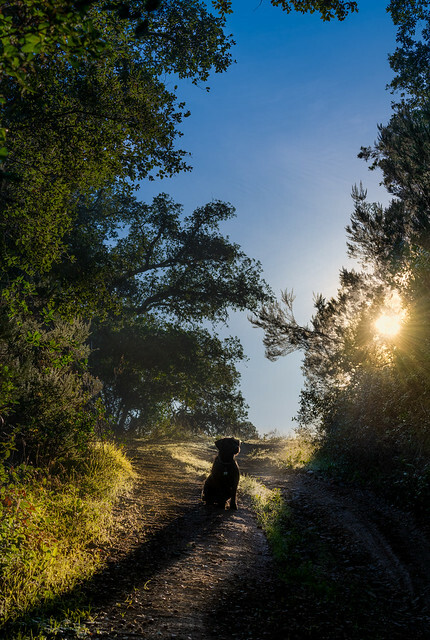 We walked up “Eagle Ridge” this morning and on the way up, Wally stopped ahead of me on the track with the sun rising to his right. I couldn’t resist a backlit shot. In case you are wondering how I got the lighting for this shot, it is 3 bracketed shots and then some masking and blending in Photoshop to show both the highlights and shadows. No Wide Angle Lens? No Problem!